These cards are awesome and kind of tough to find. Would have been awesome if Ruth and Gehrig were in there. It’s an under valued set in my opinion. I'm also up to eight, but probably stuck there for a while. 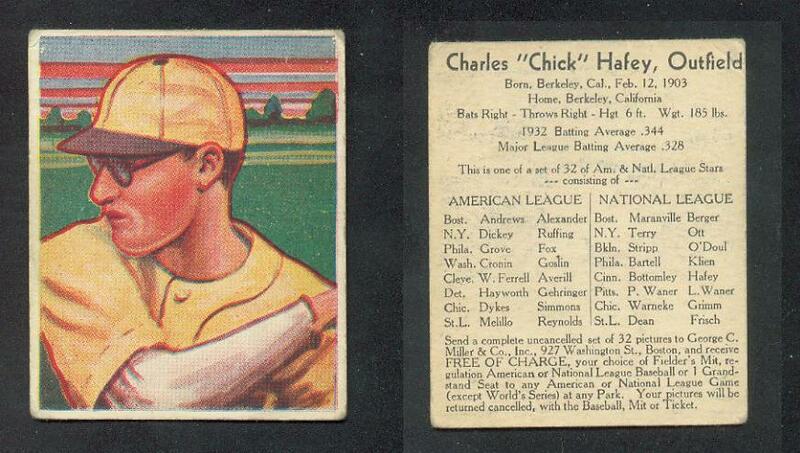 The last one I bought was pure luck, it was listed on Ebay simply as "old baseball card"
Here's mine. This is such a beautiful set. Def undervalued, especially in comparison to ‘84 Donruss (T206). I agree. Beautiful set and love the artwork as well. Love the look of this series. So art deco......from the first collection. George C. Miller --- "Dizzy Dean"
There will be a George C. Miller available at my table at the Chantilly show October 12-14. This isn't the place to advertise what you are selling, generally speaking. It is on topic so at least it has that going for it. Thanks and good luck at your show. IF I were going to be there I would come by and check it/them out. Last edited by Leon; 10-11-2018 at 10:32 AM. Mr. Z - I didn't realize you ever bought graded cards. Was this a notable exception or was my perception of your collecting habits incorrect? Here are my 1 and 2/3rds George C. Millers. 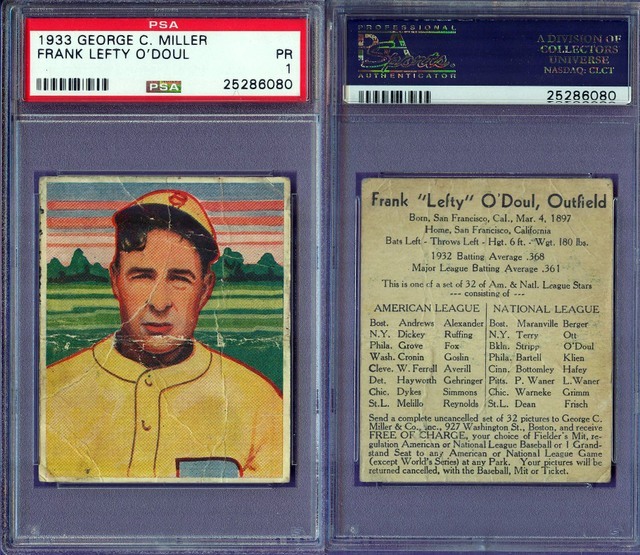 Always a set I wished I had pursued, but even back when I started vintage collecting they cost quite a bit more than other 1930's cards, and my collecting has almost always involved bargain shopping. Another wish is that the George C. Miller Company had only utilized the diamond shape punch for redeemed cards...or maybe just clipped a corner. 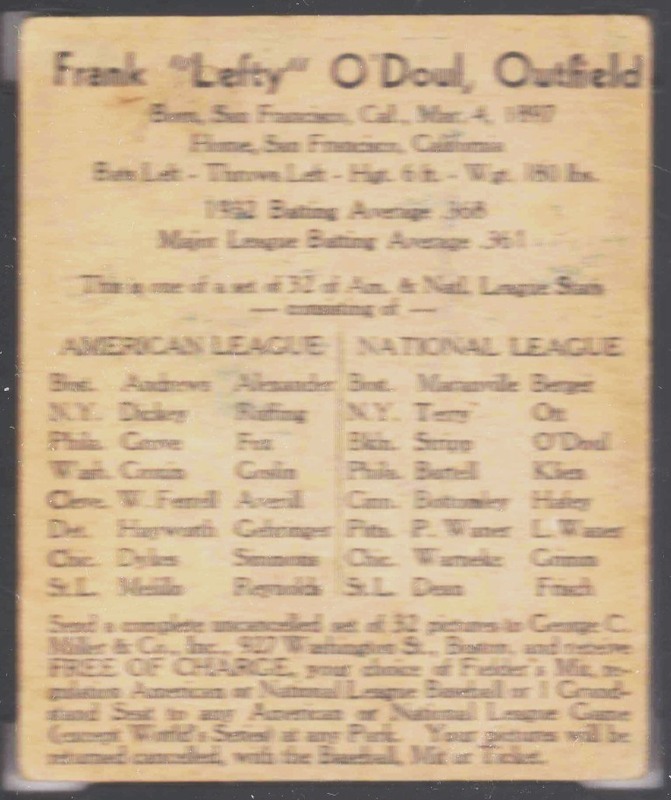 My Wally Berger and other cards with this type of redemption cut just are lacking the full visual impact that even my low condition Gehringer retains because it is more than just a horizontally orientated head and shoulder view. I really like the poses showing both shoulders. Wouldn't mind a Foxx or Grove someday. I don't have this, but cool. I believe the back is blank. Thanks for all the comments and cards from this set, gang. It had 2 stars from each of the 16 teams at the time, comprising the set of 32. It was a regional Boston issue, which may account for the Yankees being represented by Ruffing and Dickey, instead of Ruth and Gehrig. Maybe it was cheaper to not use Ruth? Being a regional Boston issue explains the rarity of the Ivy Andrews card. What better way to induce locals to keep buying packs than to exclude a card of one of the Boston players? George C. Millers are my single favorite baseball card set. 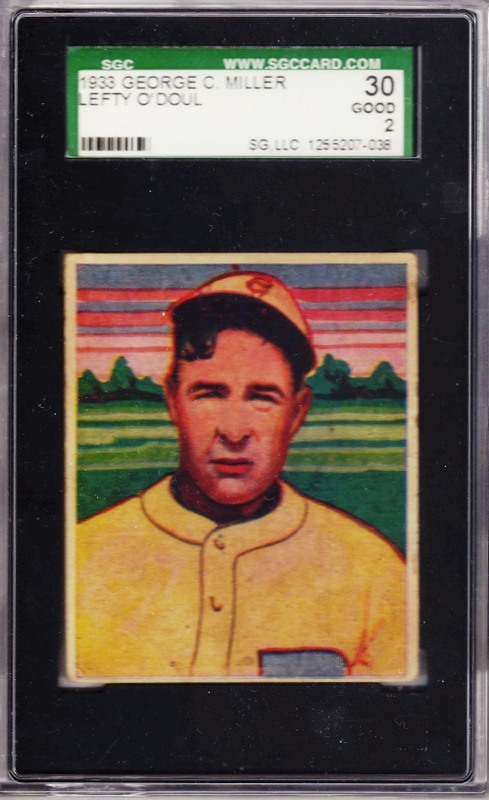 The pastel color tones are beautiful, the players significant, and the look so well captures the style of Depression-era cards. The genuine scarcity of the cards, especially in excellent or better condition, only adds to the appeal. Mr. O'Doul is now because my George C. Miller card of him is free to breathe. Look, I acquire cards that interest me in whatever form they are in. And, if they are keepers, I remove them from the hard plastic which encapsulates them. they stacked away in graded plastic pieces.